This is a great way to decorate the house for halloween. 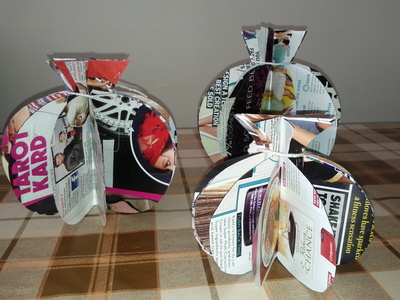 Using some magazine papers and sticky tape, make some easy 3D 'pumpkins'. These are really quick and fun to make. Take out 7 sheets of magazine paper. Fold one paper in half and roughly draw the half of a pumpkin. 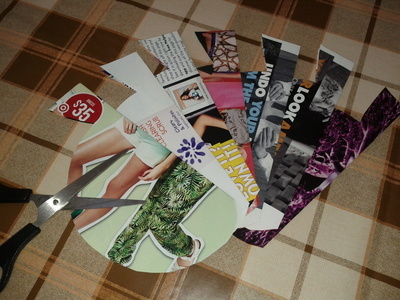 Cut along the marked lines and using the first cutting as a template, cut the remaining papers. You will end up with 7 pumpkin cuttings. 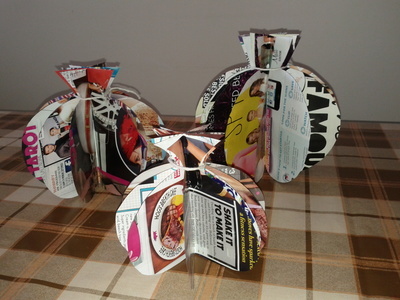 Start by taping two cuttings with each other and repeat until you tape all the papers together. Arrange the flaps (the pumpkin should hold on its own) and tie the top with a piece of string. The string should secure all the flaps. Your pumpkins are now ready to be used as decorative pieces. Note: Feel free to use orange paper and paint the top with green to make these look like 'real' pumpkins.